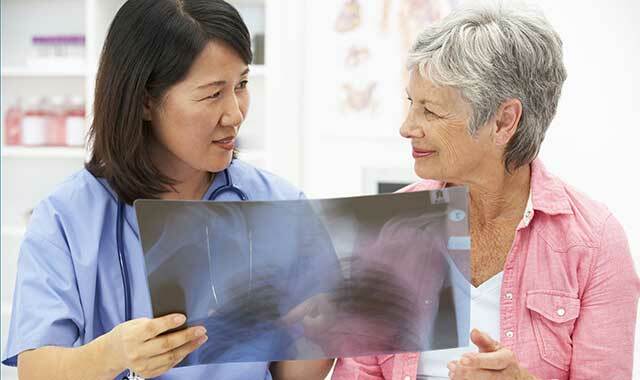 Lung cancer is the leading cause of cancer death among women, who appear to be more vulnerable to the disease than men. Still, new screening methods are helping to catch this form of cancer sooner. Awareness and understanding of major health threats can go a long way to keeping women healthy. But staying ahead of some of the most dangerous conditions requires a good dose of vigilance, too. According to the federal Centers for Disease Control and Prevention (CDC), the top causes of death among adult American women include heart disease, stroke, cancer, chronic lower respiratory disease, Alzheimer’s disease and unintentional injuries. A closer look at the top three health threats helps to pinpoint both the reasons and the need for a woman to pay close attention to her health. Heart disease is the leading cause of death among both men and women. One in every four Americans will die as the result of some form of heart disease. The sad news is that, although women once were in the minority of this statistic, they now appear to be equally as vulnerable as men. Dr. Elizabeth Retzer, an interventional cardiologist with Centegra Physician Care, in McHenry County, says women age 55 and above should be concerned about the potential for developing heart disease. But, she adds, younger women also are being diagnosed with a broad spectrum of heart-related conditions. One of the problems with women and heart disease is that they frequently have atypical symptoms not normally associated with heart attacks or developing heart disease. Retzer says women are often reluctant to complain to their doctors about these symptoms because they fear being embarrassed. Women don’t necessarily need to see a cardiologist until after their primary physician suspects heart disease, Retzer says, but it’s important to seek care when suspicions arise. Once a physician is involved, testing can be ordered to determine what type of heart problem may exist, and whether this condition involves valve disease, blocked arteries, electrical disorders, or dysfunctions of the squeezing function of the heart itself. “If testing or physical exam is abnormal, the next steps can include ultrasounds, stress tests and angiograms to pinpoint the cause of their abnormality,” Retzer says. Ultrasounds can identify tight or leaky valves, as well as problems with the squeezing or relaxing functions of the heart. Severely blocked arteries and malfunctioning heart valves also can be surgically repaired with bypass and replacement operations, respectively. Following these procedures, patients will need long-term medication management and cardiology follow-up. Patients with coronary disease may need to take medications indefinitely to stabilize blockages and keep stents or bypass grafts open. Patients with metal valve replacements need to take blood thinners, while those with tissue valve replacements are not required to do so. Metal valves can last between 15 and 30 years, while tissue valves can have a shorter lifespan. Which type of valve a patient receives will ultimately depend on the reason the replacement is needed, the patient’s other medical conditions, and the type and site of the valve needing replacement. When evaluating a potential cardiac patient, a physician may also diagnose congestive heart failure, a broad term for a multitude of heart conditions that can include damaged or dead heart muscle, weak or ineffective pumping action, or impaired relaxation of the heart. Retzer encourages women who are at risk for heart disease to see a physician if they suspect something’s amiss. Strokes occur when something blocks the flow of oxygenated blood to the brain, causing tissue damage and killing vital brain cells. When women reach the age of 45, they hit a statistical marker after which the risk of stroke increases. Most women don’t even think about the possibility of stroke until they are much older. As they experience menopause and lose the protective effects of estrogen, risk of both heart disease and stroke increases proportionately. Researchers at the Mayo Clinic report that one-third of strokes occur in women younger than 65. African-American and Hispanic women are more susceptible than are white women. Family and personal histories also play a part. At Northwest Community Hospital in Arlington Heights, vascular surgeon Dr. Sapan Desai identifies two kinds of strokes: permanent strokes that can cause lasting problems and mini strokes, called a transient ischemic attack (TIA) which last less than 24 hours. Stroke can cause muscle weakness, loss of sensation, slurred speech, blindness and other major brain damage. Desai explains that plaque buildup in these arteries can slow the flow of blood. When a clot or piece of plaque obstructs the arteries or moves through the arteries to lodge in the brain, strokes can occur. In other cases, Desai says, adverse conditions within the heart itself can cause strokes, particularly with atrial fibrillation (A-fib). The abnormal heartbeat that signifies A-Fib interrupts the consistent blood flow and can precipitate a stroke due to clot formation. Stroke may also be connected with peripheral artery disease (PAD), a condition in which the veins and arteries in the legs, and less commonly in the arms, become blocked and restrict smooth blood flow. Desai says women can improve their odds of avoiding strokes by following the common-sense advice of medical professionals. Desai also recommends that women see their primary physicians regularly and monitor their blood pressure and cholesterol levels. Many women are unaware of the signs of a stroke and thus delay seeking care until damage has already been done. These may be signs of a stroke: sudden weakness or numbness in the arms, legs or face, particularly if it occurs on one side of the body; confusion, difficulty understanding what people are saying or experiencing trouble speaking; loss of coordination, balance or an inability to walk. Some cancers have longer survivor rates and improved cure rates, but lung cancer remains an ever-present threat to women. The CDC reports that lung cancer is the leading cause of cancer death, and the second most commonly diagnosed cancer (excluding skin cancer), among men and women in the United States. The good news is that the incidence of lung cancer is declining nationwide for both men and women. Dr. Bryan Macrie, a radiation oncologist with Presence Saint Joseph Hospital in Elgin, says the bad news, however, is that the number of new cases among women is declining at a slower rate than for men. Women’s rates declined only 1.9 percent per year, while men’s rates declined 3 percent per year between 2008 and 2012. Lung cancer can be caused by environmental exposures, but the CDC reports that 80 to 90 percent of lung cancers are attributed to cigarette smoking and secondhand smoke. Macrie points out that nonsmoking women still are vulnerable to lung cancer, with one of the reasons being a speculative link to the effects of estrogen. Women who don’t smoke are more likely than their male counterparts to develop a specific sub-type of lung cancer called an adenocaricinoma that may also exhibit a specific gene mutation, Macrie says. Lung cancer treatment follows pretty much the same pattern for men as for women, but Macrie points out that women often do better than men while under treatment. Macrie says lung cancer is treated with surgery, chemotherapy and radiation with the course of treatment designed to meet the patient’s specific needs. When a woman is a smoker, Macrie says, she may have also developed cardiopulmonary conditions such as congestive obstructive pulmonary disease (COPD), which would complicate lung cancer treatment. In this type of patient, Macrie says, surgery may not be possible due to insufficient pulmonary reserve. Instead, targeted radiation and aggressive chemotherapy are used to combat the cancer. The experts at Presence Saint Joseph Hospital’s Meadows Regional Cancer Care Center focus on prevention, diagnosis and treatment of cancers. In their pursuit of improved diagnostics, one recently introduced program to screen men and women who have a long-term smoking habit aims to detect new cancers at an earlier time point, when they’re far more curable. Medical professionals agree that much remains to be done in the advancement of prevention, diagnosis, treatment and support for women not only with cardiac, stroke and lung cancer but with other illnesses as well. The key to success hinges on public awareness and education as well as the continued promotion of sound health practices and constant vigilance. This entry was posted on Monday, October 10th, 2016 at 12:00 pm	and is filed under Health & Fitness, Top Posts. You can follow any responses to this entry through the RSS 2.0 feed. Both comments and pings are currently closed.